Russian author and journalist; born at Nikopol, Yekaterinoslav, Russia, Dec. 18, 1850; son of Moses Stanislavski, a wealthy Lithuanian merchant. Simon was at first destined for a commercial career, but he finally overcame the opposition of his father, and during 1863-64 he received instruction from Dobsewitch, who went to Nikopol from Pinsk in 1861. During this period young Stanislavski carried on an extensive correspondence with such men as Abraham Lebensohn, Samuel Fuenn, and others; but his new teacher, Ilya Orshanski, turned his ambition into other directions. Under Orshanski's guidance Stanislavski read Buckle, Draper, Darwin, and Mill, and also began a systematic study of Latin, mathematics, and other sciences. Stanislavski began his journalistic career by writing for the "Peterburgskie Viedomosti," and for the "Den," which was edited by Orenstein. An article on the works of Dr. Erter gained for him the acquaintance of Morgulis and of A. Y. Landau, who in 1871 began publishing the "Yevreiskaya Biblioteka." When the "Voskhod" commenced to appear (1881), Landau invited Stanislavski to fill the position of assistant editor on that periodical. Among the most important articles written by Stanislavski may be mentioned a sketch of B. Stern's Jewish school in Kishinef ("Voskhod," April, 1884), and biographies of Mendel Levin, Israel Samostz ("Voskhod," June, 1886), Hyman Hurwitz, Solomon Posner, and Benjamin Mandelstamm. Stanislavski wrote also many other articles on various topics under the pseudonyms and "Z." 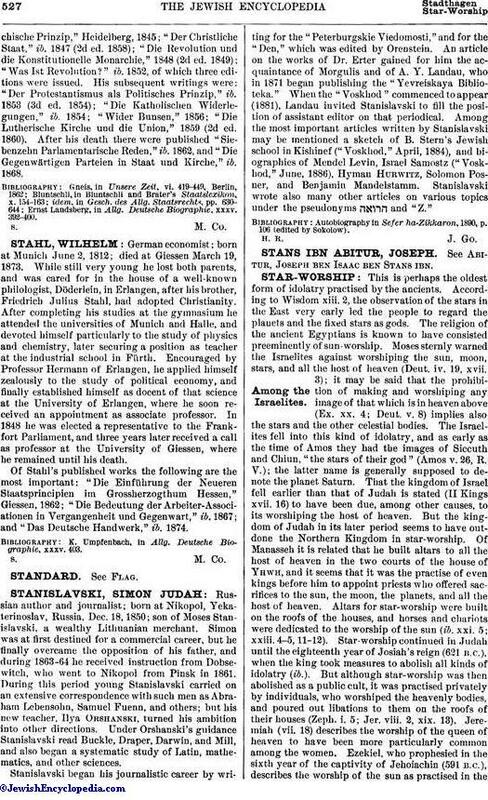 Autobiography in Sefer ha-Zikkaron, 1890, p. 106 (edited by Sokolow).